Sweet Shop Natalie: Attention Biscoff Lovers! I saw this a couple of weeks ago at My Baking Addiction's blog. I thought I have to try this out it is one of my husband favorite cookies. But I did not want the whole recipe in the house so I waited to make it for a women's summer social that my church held last night. It is yummy, if you like Biscoff you need to try it. And if you did not know that they make a Biscoff spread you are going to love it. My son was caught scooping it out with his fingers, it is that good! 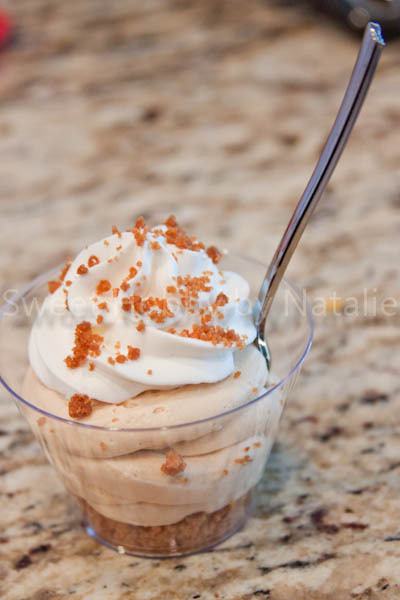 You can find the No Bake Biscoff Cheesecake recipe here. I used whipping cream instead of cool whip and it worked great!